An illustration shows how swarms of military satellite could give ordinary soldiers battlefield images on demand. Ordinary U.S. troops can only dream of on-demand battlefield images from the U.S. military's limited fleet of satellites. That spurred the Pentagon to envision swarms of cheap, disposable satellites that can give small squads of soldiers or Special Forces the latest battlefield images on their mobile phones or tablet computers. The military's Defense Advanced Research Projects Agency (DARPA) research lab aims to launch about two dozen satellites — each costing about $500,000 — for missions lasting 60 to 90 days in low-Earth orbit. Such satellites would not only launch cheaply from aircraft rather than ground-based rocket launch pads, but could also de-orbit at the end of their mission lifetime and burn up safely in the Earth's atmosphere. 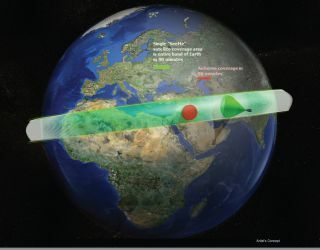 "We envision a constellation of small satellites, at a fraction of the cost of airborne systems, that would allow deployed warfighters overseas to hit 'see me' on existing handheld devices and in less than 90 minutes receive a satellite image of their precise location to aid in mission planning," said Dave Barnhart, program manager for DARPA. Having a satellite swarm could allow for more constant space-based surveillance compared with using U.S. military drones. But keeping the costs down may depend on whether DARPA can get its airborne satellite-launching system off the ground — a system intended to launch satellites into any required orbit. "SeeMe is a logical adjunct to UAV technology, which will continue to provide local or regional very high-resolution coverage, but which can't cover extended areas without frequent refueling," Barnhart said. "With a SeeMe constellation, we hope to directly support warfighters in multiple deployed overseas locations simultaneously with no logistics or maintenance costs beyond the warfighters' handhelds." DARPA's SeeMe program (Space Enabled Effects for Military Engagements) is accepting industry ideas at a Proposers' Day on March 27.